A controversial NATO conference took place in the Serbian parliament March 31st – April 1st, met with discontent by a large portion of the public as a great majority of Serbs (nearly 90%) are opposed to the North Atlantic alliance that inflicted aggression against the Republic of Srpska in 1995 and the Federal Republic of Yugoslavia in 1999. Several parties and NGOs protested in front of the parliament building and around the country. The Dveri and Democratic Party of Serbia organized a protest walk in Novi Sad on April 3rd. 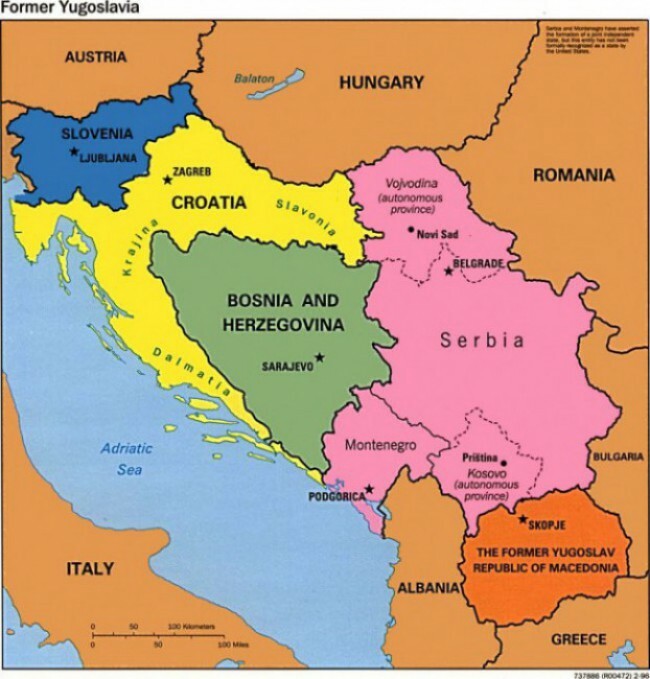 Only days after the conference ended the American ambassador to Serbia Michael Kirby made a scandalous statement referring to Serbs as a "schizophrenic people" because "their heart is in the East, but their mind is in the West." This statement met with Prime Minister Aleksandar Vućić's approval but with the condemnation of the general public and the patriotic end of the political spectre. On March 31st the Appeals Chamber of the Hague tribunal decided that the accused Serbian politician Vojislav Šešelj should return to the tribunal. This decision was met with dissatisfaction by both the Serbian authorities and most of the opposition parties. Just one day after the controversial decision from the Hague, Šešelj publicly burned a Croatian flag in front of the Palace of Justice in Belgrade, protesting the court's process against Nemanja Šarović (the vice-president of Šešelj’s party), who did likewise to flags of the EU and the USA in November 2012. Although Šešelj's party is not represented in the Serbian parliament, Croatia protested strongly, withdrawing its ambassador to Serbia for consultations, and Croatian president Kolinda Grabar Kitarović (former Assistant Secretary General of NATO for Public Diplomacy) named generals Ante Gotovina and Mladen Markač as her councillors for state security. Considering that these generals were directly responsible for war crimes and ethnic cleansing against the Serbs of the Republic of Srpska Krajina (territory of today’s Croatia) in 1995, this is a more than scandalous decision. One of the most important news stories this week went almost unnoticed by the Serbian media: the Constitutional court gave its opinion on the illegality of the border crossings established between central Serbia and its occupied province of Kosovo and Metohija. However, as the court’s decision is not in accord with the current policy of Serbian authorities on the issue they have chosen to ignore it altogether. A report on the March 13th helicopter tragedy which took the lives of all seven on board was finally released, causing yet another scandal. The military rescue helicopter was flying on a mission from Novi Pazar to Belgrade to find medical assistance for an ill baby on board. The commissions investigating the case primarily accused the helicopter crew. The pilot was deemed responsible for the accident because he allegedly had "a certain amount of alcohol in his blood." The report, however, did not mention the political leadership of the country which was probably most responsible (according to experts and media reports), for violating several regulations by ordering the crew to fly in poor weather conditions and to land at a civilian airport. According to the media, two ministers with journalists awaited the helicopter's arrival at the airport in order to present themselves as the heroes of the day. Although this turned out to be a great scandal, the Prime Minister Aleksandar Vučić is reluctant to take serious responsibility, and needless to say to fire any the ministers directly involved. Political pressure has continued against young intellectuals in Serbia. Those targeted are advised to attend so-called "informative conversations" with the intelligence agency. The trend has seemingly gone regional, as the same happened to several activists of the Movement for Neutrality in Montenegro who protested against NATO. Serbian president Tomisalv Nikolić met with the patriarch of the Serbian Orthodox Church Irinej to discuss the completion of the Cathedral of Saint Sava in Belgrade, the largest Orthodox Christian temple in the world. It was decided that the temple would be completed in spite of the bad economic situation with the financial help and expertise of Russia and the Russian Orthodox Church. The discussion over the possible changing of family law has shaken Serbian society in the past several months. The Dveri political party held a debate on the topic entitled "Who is Running the Serbian Family," in the city of Čačak. Serbian spirits are still aroused over this issue, although it is uncertain if and when the changes will be parliamentarily implemented.